What holidays do Amish celebrate? Amish appreciate time off just as any other Americans do, in order to rest, spend time with family and for religious observation. The Amish holiday schedule differs somewhat from that of the typical American, however. 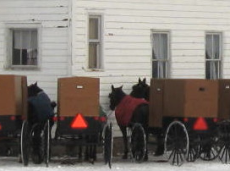 Amish generally do not celebrate public holidays, though may be granted days off from work depending on their employer. Amish do recognize Thanksgiving as well as New Year’s Day. In some settlements Amish might take in fireworks on the Fourth of July, for example. Amish do not observe Halloween, but may display decorative pumpkins (uncarved) and gourds during the autumn months. Among religious holidays, like other Christians, Amish celebrate Christmas, Easter, and Good Friday. Additional religious days observed by the Amish include Easter Monday, second Christmas on December 26th, Pentecost, and Ascension Day. Pentecost, Easter Monday, and second Christmas may not be celebrated in all communities (Enterprise, Kraybill/Nolt). Amish typically do not have special church services on Easter Sunday or Christmas, for example, but will cover the appropriate parts of Scripture during the Sunday service closest to those days. Amish undergo fasting the day before communion in spring and autumn. Good Friday and St. Michael’s Day are days of fasting as well. Amish exchange gifts at Christmas, though they do not put up a Christmas tree or teach children about Santa Claus. Some Amish schools may put on an annual Christmas school program. At Easter, Amish children may color eggs. In some communities, for Valentine’s Day Amish children may exchange cards and candy, or adults may have a special dinner. 8 responses to What holidays do Amish celebrate? What is Saint Michael’s Day and what significance does it have for the Amish? I’d appreciate an answer from someone! St. MIchael’s Day (Michaelmas) is September 29th. As it is my name day, I know that, and in the ancient churches (Roman, Orthodox, Anglican), it is a special day marking a seasonal transition (kind of like “first day of autumn” for the church) as well as the feast day honoring the archangel. Why the Amish, a very protestant group, observes Michaelmas, I cannot tell you. It’s an interesting question, though. The only holiday that I know of that the Unity ME Amish community celebrates besides their own birthdays is Thanksgiving. Not Christmas. I will ask Louella to make sure. I live in Lancaster County, PA. As I was traveling to work this morning, there were MANY horse/buggies on the roadways very early. If I’m not mistaken, today is a religious holiday for the Amish but I cannot remember what it is … maybe All Souls Day. Does anyone know more about this? Thank you. The Amish holidays are the same ones still celebrated in Switzerland today, at least around Zurich where my daughter lives, though most of the activities have been secularized. I knew an Amish family that hid a Christmas tree in the closet from the Bishop and anyone not in the family. These people later jumped over. I was wondering if Amish/Anabaptists observe lent and do any fasting. I’m surprised to find out that there’s only few days in a year. My denomination (orthodox) requires fasting every Wednesday and Friday,40 days before Easter, the summer lent, 40 days before Christmas, and various other individual lents. Most of the lent we can’t eat meat fish eggs dairy or oil, some days oil is ok (Sundays). I was honestly surprised to learn that such a strict religious group, that I honestly admire for their strength and rules, actually is very forgiving when it comes to food. For us gluttony is a sin, thus the fasting is all year round and lasts several months. Leave a reply to What holidays do Amish celebrate?